Posted May 9, 2017 by BUTCH Voices. 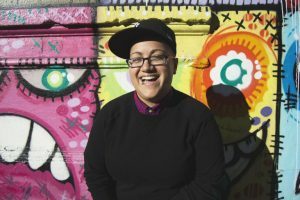 Thanks to the staff over at Curve Magazine for their write up of the upcoming 2017 BUTCH Voices National Conference! Butch identity is something we cherish forever. Butchness is about more than just an androgynous aesthetic: it’s about messing with stereotypical gender roles, and celebrating all bodies in all their forms, and the desire that stems from difference and sameness simultaneously. For a long time, a butch aesthetic was pragmatic for lesbians, as it signaled their queerness to other gay women. Today, we acknowledge that butch women are doing far more than putting out a siren call – just by living their lives, they are doing vital work for social justice and equality. In 2008, BUTCH Voices was created to unite a cross section of Masculine of Center* womyn and trans identified people who challenge social norms. It is a movement that has its roots in gender justice. The vision was to create space that would counteract the isolation so many of us have felt on account of our gender presentation, gender identity and/or sexual orientation. This year, BUTCH Voices will once again convene in Oakland for our 2017 National Conference, from Thursday, August 17th to Sunday, August 20th. They are excited to work with the folks at Oakstop for their conference home for workshop and keynote spaces. Hell yes! Read the full article and more over at Curve!